A public access defibrillator is a piece of equipment that can be installed at any location providing there is a power source. A modern defibrillator normally has a voice command system or small screen which gives a step by step guide to the person using it how to administer a ‘shock’- this means that even someone without full first aid training can save a life if they act quickly. Hopefully one day we will live in a world where everyone who wants to has attended a screening at a young age and effective treatments for cardiac conditions are in place leading to a huge reduction in the number of sudden cardiac arrests that happen every week. Unfortunately, even when we get to this position cardiac arrests will still happen. We know that young people with undiagnosed cardiac conditions are more likely to have sudden cardiac arrests in certain places such as sports facilities and schools. This is because cardiac arrests in young people often happen during exertion. Jay's AIM works within communities to establish the locations most in need of defibrillators, before helping to fund, supply and fit the lifesaving pieces of equipment. We then work with the establishment where the defibrillator is located, as well as local ambulance services, to ensure the equipment is kept in good working order and is checked annually. The cost of a defibrillator varies, depending on a number of factors. Jay's AIM generally needs to fundraise approximately £1700 to buy and fit a fully functioning defibrillator. The upkeep of a defibrillator also varies depending on the county that you live. The cost in electricity to the establishment it is fitted is minimal and is normally only about £3 a year. In some counties local ambulance services are responsible for a defibrillator's upkeep; in others this can be funded by Jay's AIM. 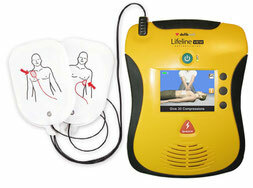 How can your sports club, school or Business apply to be considered for a defibrillator from Jay's AIM? In order for us to establish the areas within the South West most in need we need your help! If you feel that your sports club, school, business or area that you exercise and train in, should have a defibrillator, please get in touch with us using the ‘contact’ page. We will then meet with an official from your establishment in order to understand the suitability of the request. A shortlist of suitable establishments is created after consideration of a range of criteria, including the number of young people who could potentially benefit from the device, how accessible the proposed site is for members of the general public in an emergency, and the proximity of other AEDs to the site.